STREETERVILLE — Cubs star Anthony Rizzo got teary-eyed after bringing a $3.5 million check to Lurie Children's Hospital on Tuesday, saying his charity's work is more important than winning the World Series. 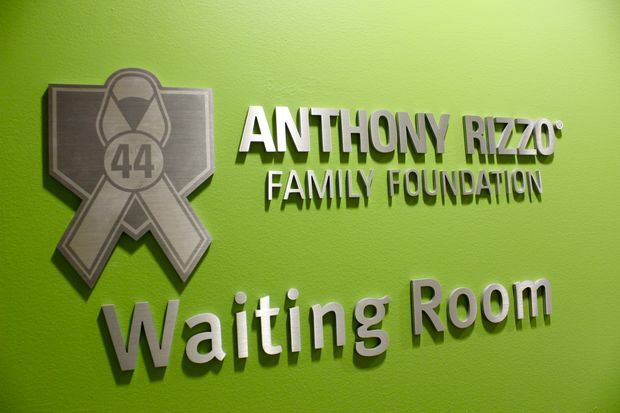 Rizzo, a cancer survivor himself, reminisced on his days as a patient after making a gift that will fund oncology specialists and give grants to families in need at the hospital, 225 E. Chicago Ave.
Lurie's 18th-floor waiting room now is named after Rizzo's foundation, which the first baseman said has contributed $4 million to the hospital over his career with the Cubs. "This means a lot to me," an emotional Rizzo said after cutting the ribbon in the waiting room. "I remember sitting with my mom 10 years ago saying 'we're going to do this.'" Rizzo underwent six months of chemotherapy for Hodgkin's lymphoma when he was an 18-year-old minor leaguer playing in the Boston Red Sox farm system. 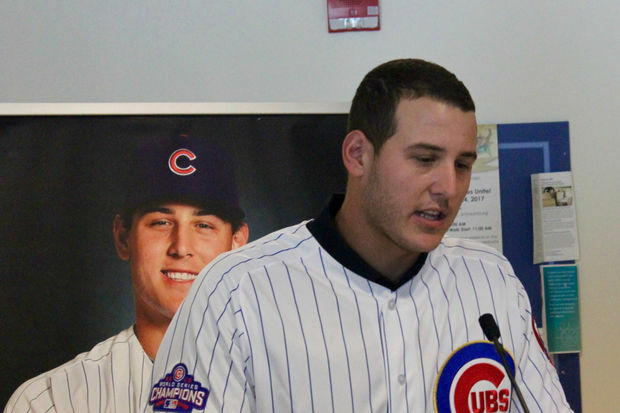 Rizzo, now 28, has been in remission since 2008 and has made cancer research, among other causes, a priority for his foundation. Rizzo was joined by his parents and fiancée at the event, which also brought out Lurie patients who exchanged high-fives and hugs with the Cubs star. 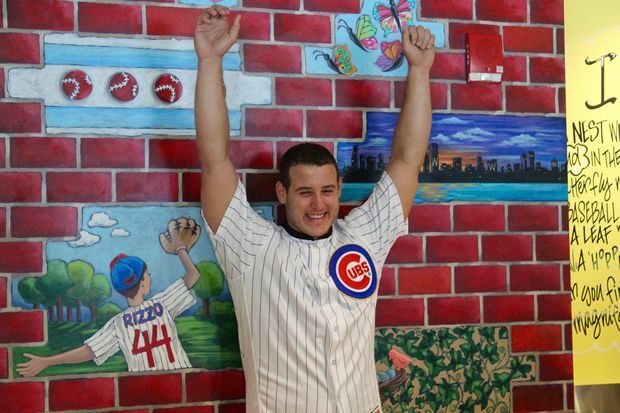 Rizzo has regularly visited patients at the hospital throughout his Cubs career, and said his charity's work isn't done. "It's uplifting when you can get away from reality for a bit," Rizzo said. "A moment for me is a lifetime for someone else, and that's something else." One visitor was Ethan Hugins, a 7-year-old from suburban Naperville who was diagnosed with a tumor behind his eye last year. Rizzo made Hugins smile when he visited the boy at the hospital, and also paid for his family's lodging when they went to New York for a recent surgery. Rizzo "is the difference between us being super strong for our kids versus wondering how we're going to do it," said Brian Hugins, Ethan's father. "He's an MVP in the true sense of the word. He's what's good in all of us." 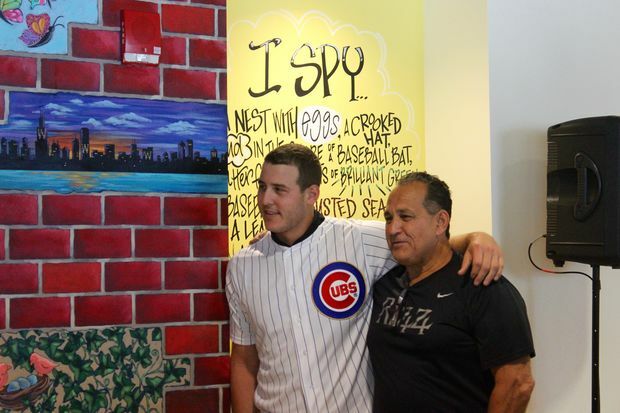 Rizzo with a new mural unveiled Tuesday in the waiting room.